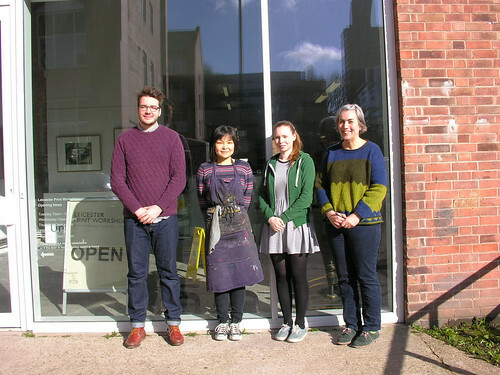 LPW Artist in Residency Programme is open to all experienced printmakers and is designed to encourage artists to create new work for exhibitions and to bring new ideas and vibrancy to Leicester Print Workshop. In 2015 – 2016 we awarded three Our Big Move Artist Residencies to artists Sumiko Eadon & Emma Gardner (working in collarboration), Sarah Kirby and Theo Miller. Read more here. Previous Artists in Residence include Kate Da’Casto, Sue Baker Kenton, Nick Mobbs, Peter Clayton and Laine Tomkinson. We appoint a self-funded Artist in Residence each year. We recruit through our Opportunities page, our newsletter and social media. To receive our updates please sign up to our mailing list and follow us on Facebook and Twitter. Back to the Opportunities page.